Who Has the Best Pizza by the Slice in Downtown Las Vegas? Finding a great slice of pizza isn’t always easy. Las Vegas has a ton of good pizzerias, but not all of them will sell pizza by the slice. However, some of the best pizza in downtown Las Vegas is sold by the slice. Here’s a look at the top pizzeria selling slices of pizza in downtown Las Vegas. Pop Up Pizza – The Best Pizza By the Slice! 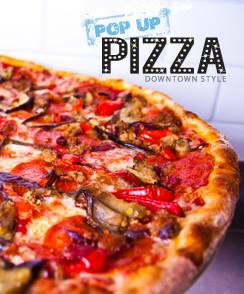 Downtown-Style pizza is simply the best you will find in the Las Vegas area and Pop Up Pizza has it. Whether you prefer traditional toppings or something a little more unique, you can find it here. You can even take advantage of the “buy 9 slices, get the 10th free,” punch card. With so many types of pizza available, you can’t go wrong with Pop Up Pizza. Getting a slice of one of the most delicious pizzas in Downtown Las Vegas will certainly make your taste-buds happy. Visit this top downtown pizzeria any day of the week from 11am to 2am for a slice or two. Pop Up is by far the winner for pizza by the slice in Downtown Las Vegas, but Slice Vegas is another decent choice. They serve fresh Italian pizza with plenty of good options. You will also find plenty of beverage options here and a deli counter open until 2am on Fridays and Saturdays. You can certainly grab a slice of pizza from Slice Vegas, but if you’re already downtown, why not choose the best and pick up a slice from Pop Up Pizza. Why is a Slice of Pizza so Magnificent? When you head to the downtown area of Las Vegas and you’ve been out partying all night, there’s nothing better than a hot, delicious slice of pizza. However, not all pizza joints are equal. You want that perfect slice of pizza because you know it’s going to make you feel better immediately and in the morning. Downtown Las Vegas doesn’t offer a large number of late-night dining options, but Pop Up Pizza stays open until 2am to ensure you get the best pizza in downtown Las Vegas, even late at night. Whether you just hit it big at one of the casinos or you just have a late-night craving for pizza, you can always find a fresh, hot slice of pizza at Pop Up Pizza.